Interesting Camp in the "Southern of Hokkaido" | PARE MEMBERS' CHAT ROOM! Interesting Camp in the "Southern of Hokkaido"
Hello everyone, here Dewi, I would like to continue my stories when i stayed at Hakodate, Hokkaido, Japan. In August 5th-6th, 2016, I participated an event that held by Onuma International Seminar House. It was Camp in the Southern part of Hokkaido. 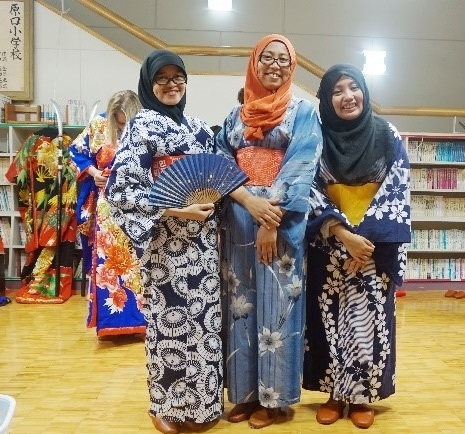 They held this event for International student who interested in cultural exchange. really enjoyed this event because i got to know many Japanese student, International student and local people that lived there. Our destination was Matsumae and Kikonai. First we went to Matsumae Castle Park for lunch. I got to see beautiful Castle while taking lunch with everyone. Its really good experience for me. After finished lunch, we got to go inside the Castle for sightseeing. For entering the Castle every people need pay about 300 yen. Then we continue our journey to Matsumae Koryu no Satozukurikan one of our main goal. Our activities in Matsumae was Fishing, cooking together with local people, trying yukata and finally sport competition (table tennis). The next day we went to Kikonai, our second and last destination. With local people in kikonai, we experienced fishnet and seafood BBQ for our lunch. I got to know how to use the fishnet for capturing the seafood. This event make me know many thing that i don't know before, i got much friends, understanding little of Japanese local people and also got very exciting experience that be my wonderful memories.